Seth Godin manages to inspire me. He read this audio book himself, and he pours all his heart into it, you can sense it. So...what is a linchpin? Godin defines it as an indispensable person within an organisation. Someone an organization can't work without, just like a real linchpin is indispensable within a complicated mechanical device. What affected me most was his definition of art, which is quite different to the concept I had in my head. Godin says, an artist strives to create a change in other people by what he or she is doing. I previously thought it was a means of expressing yourself and finding out who you are. This is a huge difference and shook my world. I will keep both concepts and internalize them. Godin says, for a linchpin life is a piece of art, and an artist cares about everything he or she does. So a linchpin is not indispensable just for the sake of it, not out of fear or strategy, it's a consequence of just being true to oneself. You can't simulate being a linchpin. But you might become a linchpin, as you might be that kind of person, just not having actualized your potential. In this case the book is for you. An important issue that might hinder you from being a linchpin is your lizard brain: This is the part of your brain that hasn't evolved: It tells us to flee when it senses danger or risk, it triggers fear. I guess everyone has encountered situations where an inner voice told us we should quit. We then rationalize it and don't challenge this impulse. Godin tells us that this part of the brain is hardly of any use any more, as there are no real life threatening dangers any more. Godin tells us to sense danger, but then acknowledge and overcome it. He encourages us that we can achieve anything we dream of. Linchpins are per se generous, they give gifts. Not in order to get anything back, like in a deal, just for the sake of giving. It's within their nature. For a linchpin, the act giving makes them richer, not poorer. By giving gifts, a linchpin creates a web of other people around him or her. A linchpin takes action and doesn't wait for orders. A linchpin makes a difference in everything he or she does. Simple as that. 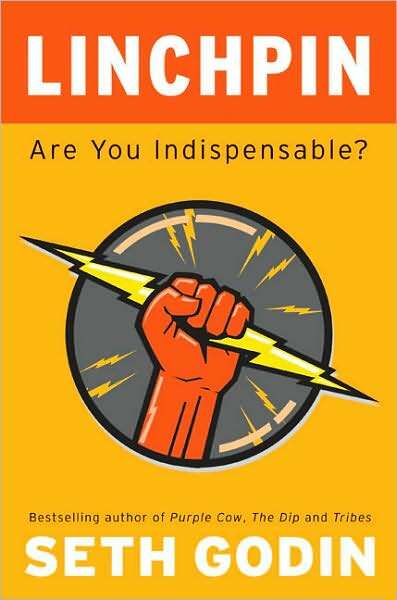 I like Godin's holistic approach, he creates the image of the linchpin, but it's not a check list that you need to go through, it's up to you how to become a linchpin. I definitely recommend this book. I want to be among people who think of their life as art, who are not reasoning and make compromises: These people inspire us and help us become another person. A very inspiring book.